When more traditional remedies are ineffective, diverticulosis and diverticulosis both respond to treatment protocols. One of the key concepts of Diverticulitis and applied kinesiology is diet review and manual exercises that help with the ileocecal valve. The ileocecal valve is a small sphincter muscle, which separates the large intestine from the small intestine. This can be influenced by specific exercises. It can be found on a person’s abdomen and is easily treated with finger pressure. 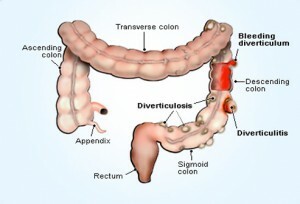 In western medicine, diverticulitis is basically defined as “an inflammation of the diverticula of the intestinal tract”. This causes stagnation of feces and can lead to more serious disorders, such as Crohn’s disease. In traditional western medicine, this is treated by laxatives and antibiotics, which often have only limited success. By contrast, in treating Diverticulitis, a therapist would examine the reflux point on the abdomen. Through proper muscle testing, it can determined if the valve is operating properly, and if it is stuck either in an open or closed position. If this is the case, there are a series of simple home exercises that can be used to correct this. This must be done several times a day and generally, take less than a minute to perform. The treatment can be supplemented by the use of acupuncture points, which can also be stimulated with manual pressure. Diet review is important as highly refined diets will result in the slower passage of the colon contents. This is especially true if an individual has poor carbohydrate digestion. Your applied kinesiologist may also recommend the use of food enzymes and a probiotic. Both assist in digestion and help to reinstate good bacteria into the colon. At Chiropractic Health and Acupuncture, we have been treating the greater Rochester NY area since 1983. Call today for a free consultation and put yourself back on the road to health.